With every update we keep on improving our Spring frameworks support. In IntelliJ IDEA 2016.1 we focused on Spring Boot and plain Java-config configurations experience. With every update we keep on improving our Spring frameworks support. In IntelliJ IDEA 2016.1 we focused on Spring Boot and plain Java-config configurations experience (of course, in addition to addressing other reported issues). During the EAP we already mentioned better Spring Boot support. In this post, we’d like to provide more details on improvements for Spring MVC, Spring Data and Spring Core. 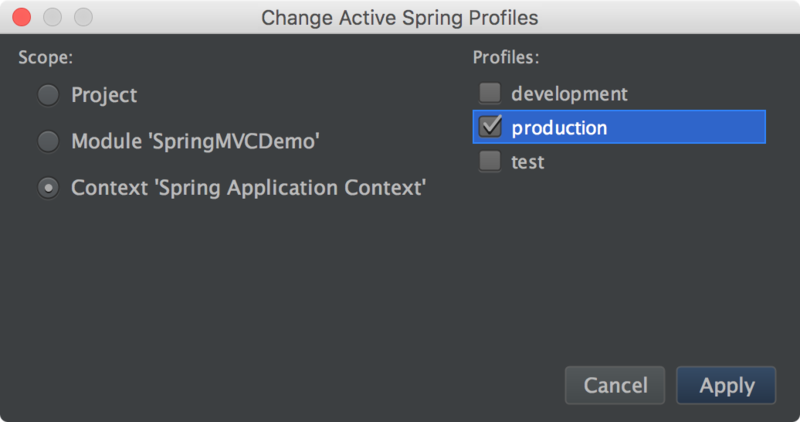 We’ve also added a new action called Change Active Spring Profiles allowing you to change the active profile for a selected module or the entire project in one step. Non-annotated beans extending CrudRepository now are resolved correctly. The aliases defined with @AliasFor for @Bean , @Import and @ContextConfiguration are fully supported now. We’ve added support for @EnableBatchProcessing , @EnableLoadTimeWeaving and @EnableSpringDataWebSupport . New for Spring 4.3: @Autowired is not required if the bean defines only one constructor. The facet configuration now processes context dependencies recursively. Also, we’ve fixed a great number of issues related to autowiring. Performance has been significantly improved for projects using Spring AOP and Spring MVC. Developers having a large number of XML configuration files will notice great decrease in memory usage. See the complete list of resolved issues. Published at DZone with permission of Yann Cébron , DZone MVB. See the original article here.